The location of the Catalonia Las Vegas makes it the ideal holiday destination for people who want to be right in the middle of it all. It’s right on the doorstep of the beach and the Martiánez beach and offers guests stunning views of the Teide Mountain. 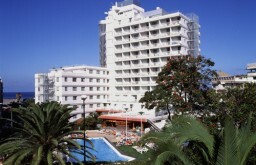 To top it all off it’s right in the middle of the busy resort town of the Puerto De La Cruz. You can explore the entire island on the easy access buses which stop just 10 minutes from the hotel and there’s even a taxi stand right outside. Once you’re inside the hotel, there are 261 rooms ranged over 13 floors and everyone has their own ensuite and balcony overlooking the sea or the hotel’s gardens, plus a satellite TV connection. The hotel also offers a heated outdoor swimming pool, kids pool, salon, mini golf, sauna and a really well stocked bar and restaurant for the customers to enjoy. Perfect for families because it’s so near to everything. You can literally walk onto the beach from the hotel and you’ve so many options to explore the other towns.